Modal library available for Vue.js. 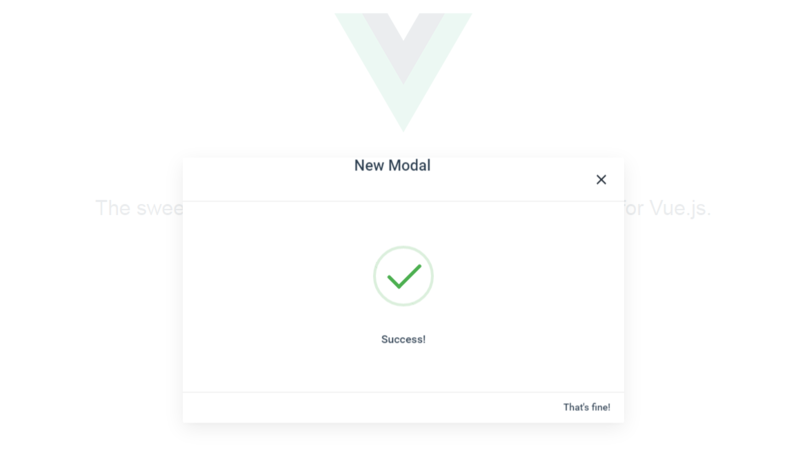 - Vue.js Feed Modal library available for Vue.js. Modal library available for Vue.js. Sweet, easy and good looking modals, similar to sweetalert, but made for Vue.js (jQuery too). Check the examples and for Vue.js here, or create your own! Please note that <sweet-button> is an implementation specific to these examples. You need to implement your own buttons for use with SweetModal. Install Note: This is a library solely for use with Vue.js. Open your modal by calling this.$refs.modal.open(). Add it in you template. Check more attributes on the documentation. SweetModal is available on GitHub.